Signs Project | Remembering Litvaks, Inc.
At RLI’s suggestion, the Rokiškis Regional Museum (“Museum”) is working with RLI and experts in several fields to design a series of informational signs written in the Lithuanian, English, and Yiddish languages that will be installed in several towns in the region and will describe the specific characteristics of each town when they were “shtetls” with majority Jewish populations. The first such sign was installed on Rokiškis’ Synagogue Street (Sinagogų gatvė). Prior to World War II, three synagogues stood on Rokiškis’ Synagogue Street. They were painted, respectively, in the three colors of the Lithuanian flag. The synagogues were destroyed during the war. Since the war, the only indicator of the prominence of the street to the former Jewish community was the street name itself. Few Lithuanians have ever visited a synagogue, so even the functions of a synagogue are not generally known. For this reason, an informational was developed that explained the architecture of a synagogue and the various religious and social activities that would have been held in a synagogue. 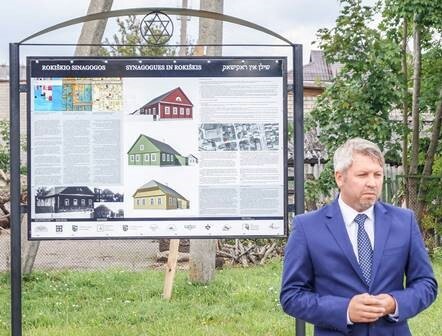 The effort to research and design this sign was jointly led by the accomplished Lithuanian architect Aurimas Širvys, who is a native of Obeliai, in the Rokiškis region, and the Museum’s deputy director and gifted historian, Giedrius Kujelis. 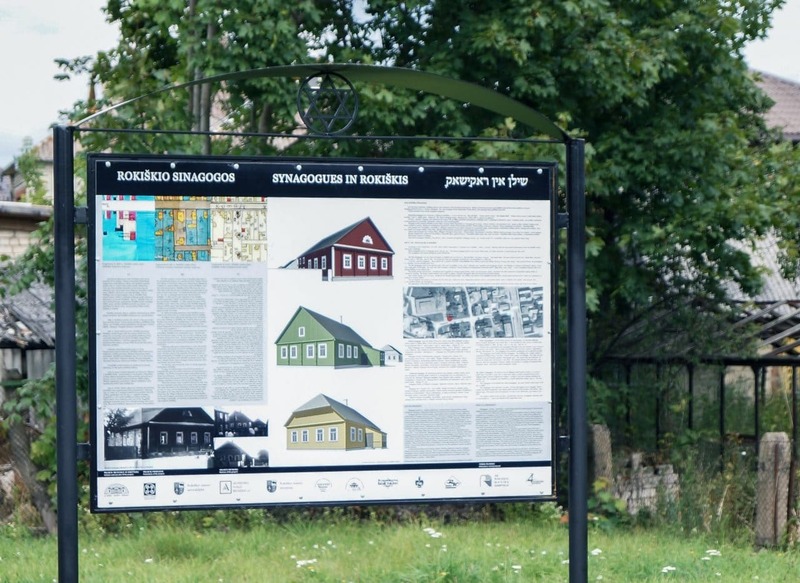 Aldona Shapiro assisted them in developing the sign’s counterpart Lithuanian and English and Lithuanian text and the author Ellen Cassedy and members of the Vilnius Yiddish Institute developed the sign’s counterpart Yiddish text. And I believe that, step by step, we have to come back. And, on my behalf, I promise, that our people will treat all nations with respect – with great respect.